Provide comfort for the family of Mary Gross with a meaningful gesture of sympathy. 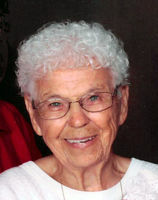 Mary Lena Gross joined her husband Frank and daughter Linda in heaven on Friday, March 29, 2019. A lifelong homemaker in Sugar Creek, Missouri, Mary had loved Polka dances with Frank and babysitting little ones for their working mothers. She was known for her outstanding Slovak dishes and her baking. During her later years she enjoyed working jigsaw puzzles and cheering the KC Royals on T.V. Mary fed the birds year round and on nice days watched them as she said her daily rosary on her deck. She is survived by her sons Edward Lee and Gary and his wife Carolyn, granddaughter Teresa Terry and her husband Bill and a great granddaughter Allison Marie. She will be missed by her sister Rody Dendish and her nieces and nephews. Visitation will be at St. Ann’s Catholic Church in Independence, MO on Tuesday, April 2, 2019 9:45 am. The Rosary will be prayed at 10:30 am followed by the Requiem Mass. Mary will be laid to rest by her husband Frank at Mt. Olivet Cemetery on Blue Ridge Blvd in Raytown. Family suggest in lieu of flowers contributions to St. Ann’s Catholic Church. To send flowers in memory of Mary Lena Gross (Gorsic), please visit our Heartfelt Sympathies Store. Donations are being accepted for: St. Anns Catholic Church. Consider providing a gift of comfort for the family of Mary Gross by sending flowers.